The northern coasts of Africa offer sweeping views of the Mediterranean Sea, and the fish and other animals that come from this body of water are among the more delicious varieties found in the world. To the south, the Indian Ocean offers much of the same, and the Atlantic in the east is home to a wide array of wildlife. The cuisine of this continent is unique and appetizing, and a chef can use restaurant equipment to replicate the complex taste of African dishes. One simple meal to prepare is grilled Moroccan chicken. Food.com suggests using a combination of oil, scallions, parsley, cilantro, garlic, paprika, cumin, salt, turmeric and cayenne pepper as a zesty rub to give chicken cutlets some spice. 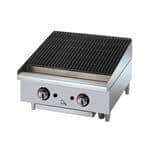 The ingredients should be blended in a commercial food processor for maximum effect, and a unit like the Eagle CLCHRBL-48-NG RedHots Chef Line charbroiler can be used to cook the meat as desired. Another option is a fish called the snoek, which is found off the coasts of South Africa. With a little apricot jam and masala spice, a chef can transform this aquatic creature into a delectable meal that can be served with other exotic flavors.